Experiencing an earthquake for the first time is awkwardly exciting. It is disturbing because of the power and damage that can be caused, but still interesting to live through. Yesterday a magnitude 5.4 earthquake occurred. The epicenter was about 30 miles away from us but it was still easily felt. I was on the phone at the time and had to pause a conference call while I stepped outside to make sure nothing terrible happened. Finnegan, man’s best friend who supposedly has a natural instinct for when these sorts of things are going to occur, SLEPT THROUGH THE FIRST HALF OF IT. Seriously! He was lying out on the lawn just napping away in the sun like he normally does in the afternoon. As I got up and went out to greet him (with things shaking all around) he finally popped up, let out a surprised bark and proceeded to run a few frantic circles around the yard. Too late buddy, fun’s over. 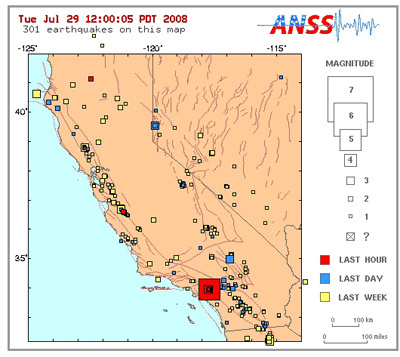 Reports claim that the quake lasted between 20-45 seconds depending on where you felt it but for us it was probably about 30 seconds. Keep in mind I had enough time to A) figure out that an earthquake was happening B) tell my people on the phone that an earthquake was happening and excuse myself from the conversation, C) make a conscious decision that maybe being inside around stacked boxes and a storage area was not a great idea D) rectify the situation by walking around a couch, through a room and outside. AFTER I had done all of this Finnegan woke from his slumber. To his credit he does kick a lot in his sleep and shake himself so this might have not been a concern for him even if he were awake but still. The whole thing, as I said, was exciting but I would not be mad if I never again felt one. Finn on the other hand, while I’m not sure he was even awake long enough to realize there was an earthquake. Poor little guy, he missed out on possibly a once in a lifetime opportunity. r u kidding? that little dog kicks so much in his sleep he has his own personal 9.0 earthquake nightly.